Facing a ridiculously long trip home from Dalian, China, I resolved to not waste all the hours between flights with too much caffeine and the latest murder and mayhem-filled paperback. First stop, Seoul, and a very happy beginning to this resolution. The Incheon Airport offers much in the way of Korean culture for passengers who have one hour or many to spend in the terminal. There's also heaps of glittery shopping. Not at all tempted to browse the shiny and new Louis Vitton shop I went straight for the culture. While the terminal's exhibits offer beautiful displays of art and artifacts, the Korea Traditional Culture Experience Center offers the opportunity to make art. I spent some of my two hour layover making art and making friends. Seon Jin Park (pictured above left and with me) set me up with the art project. 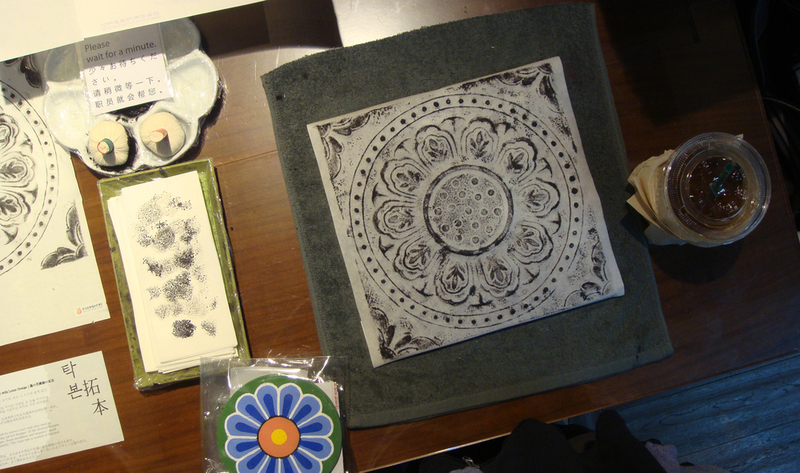 I made a rubbing of a floral medallion with a lotus design. The rubbing was made by tapping liquid graphite onto dampened mulberry paper that covered the tile. I wondered how I might translate this method into my art journal and shared a few of my pages. 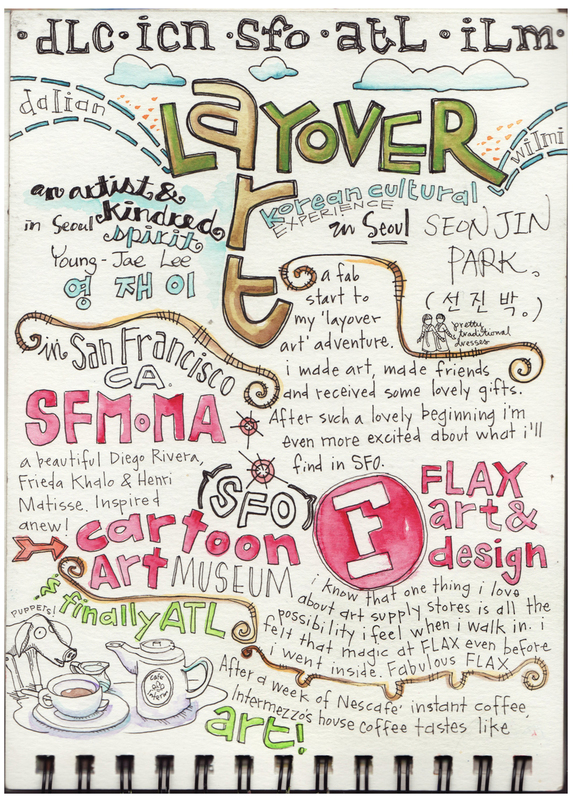 Seon Jin Park invited her colleague Young-Jae Lee, herself an artist, to join us and check out my journal. We had such a nice visit and a chat about the spirit of art and inspiration. Such a nice beginning to my layover art adventure. Too soon the time came to trek across the terminal to my gate for the next leg of the journey. Next stop, San Francisco.